My journey into motherhood started seven years ago with what I thought was a perfect pregnancy and birth. Despite being a workaholic at heart, still rushing to finish a project as contractions were progressing, I was thrilled to become a mother and thrived in my new role from day one. Although dark and short days in December and icy pavements in January kept me trapped at home with a newborn for days on end, I was truly enjoying the perfectly imperfect days and nights with my son. He was a baby who let me know loud and clear that he needed to be close to me pretty much all the time. And I gladly carried him day and night, mostly in my arms. As weeks went on, I was getting increasingly tired of never being able to put my son down. For a short period I discovered that if I put him to sleep in my arms while wearing a cozy zip-up fleece jumper, I could sometimes lay him down and sneak out by taking the jumper off, while still leaving the arm wrapped around him. A very clever trick that worked only for so long as Lukas called my bluff. I needed a solution and after a failed attempt to make a stretchy wrap work, I stumbled upon a buckle carrier that seemed to be a solution that worked for us. 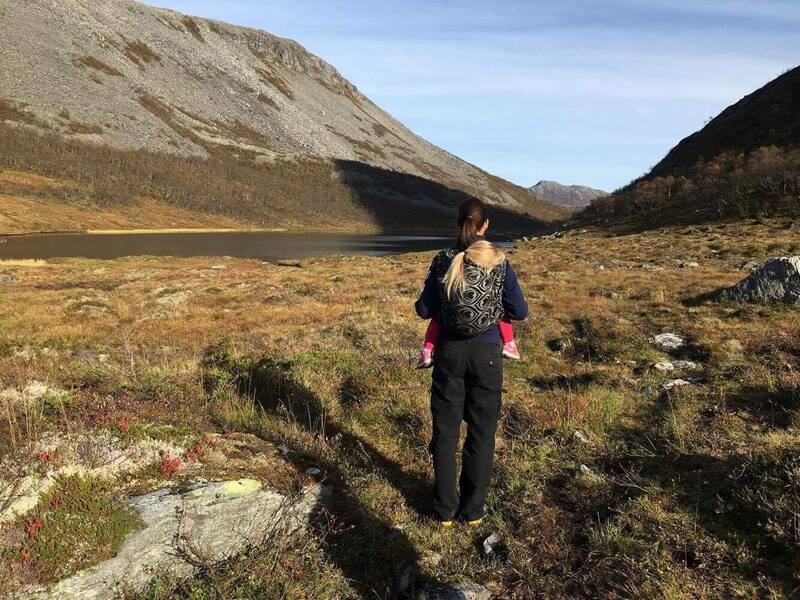 I loved carrying my son and took him with me everywhere I went: from boats to hiking trips, he was happily observing the world close to me. A couple of years later my first daughter was born and just like my son, she spent a lot of time snuggled up on me in a carrier. We both enjoyed being able to carry on with our days chasing an active toddler without any obstacles. Although I didn’t find the carrier comfortable for my back, it was a solution that worked and so I followed my instinct to put my kids first. My babywearing story might have ended here had I not developed severe lower back and hip pains. People around me were quick to blame my discomfort on babywearing and after excluding a variety of possible reasons I also came to the conclusion that it was wrongly distributed weight of my kids that was causing it. It was such a difficult realization to swallow and at that time, pregnant with my third baby and unaware of any other alternatives, I decided not to carry my youngest daughter. We greeted her into this world well equipped with a number of strollers. Fast forward 10 months later, one conversation with a friend changed it all. She introduced me to Artipoppe and something just clicked. At first it was the aesthetic appeal that captured my attention. I was drawn to the idea that satisfying a basic need of keeping your child close can be so much more than that. The different blends to meet the personal preferences of each mother and child, as well as pattern-color combinations to make as big a fashion statement as one´s heart desires kept me fascinated. I tried my very first Artipoppe wrap with my chubby 10-month old and a sensitive back and it was perfect: cotton-cashmere blend provided enough support and cushiness to distribute the weight of my daughter equally throughout my body so that the pressure on my hips and lower back that I was so used to feeling was gone. I was ecstatic! For me, it meant going back to being the easy-going parent that I love to be, without needing to schedule the family days around the nap times of my youngest. It meant saying “yes” to my older kids when they wanted to go explore the world, instead of slowing them down because of the needs of the baby. Gradually I was experimenting with different blends and patterns, testing the wrapping qualities of the wraps with my not so small kids and once in a while surprising myself by my attraction to colors that I would never considered for my clothing. It didn’t take long for Artipoppe wraps to not only become a necessity with 3 kids under the age of 4, but also my number one accessory of choice. What took me by surprise though, is that beyond wraps, Artipoppe brought into my life a community of women, a support system that I did not have and was longing for. Being a mother in a foreign country, with no family around, can be a lonely and isolating experience. 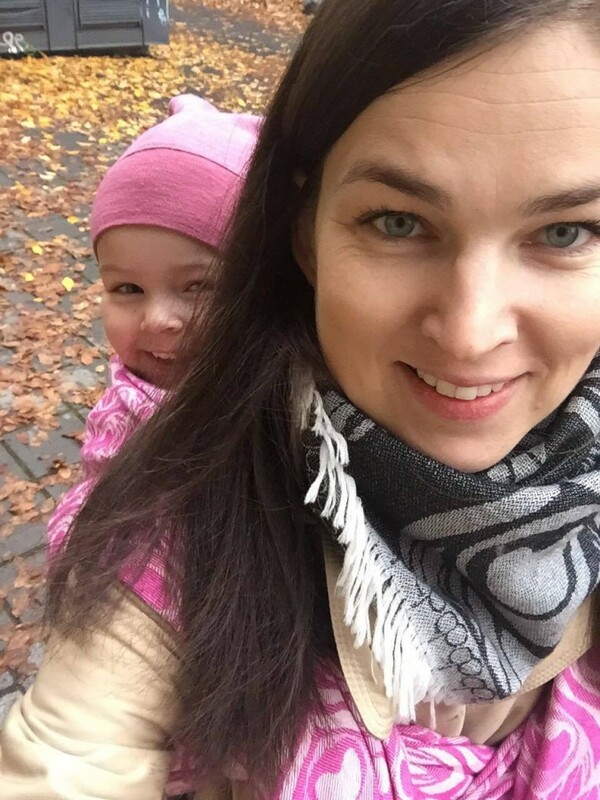 As a Lithuanian in Norway, I was grateful to the health system in Norway that arranged meetings for mothers with babies close in age living in the same area so they get connected and not feel alone. During the meetings that I attended, different perspectives and takes on motherhood were enthusiastically shared in the group by mothers of different walks: from various countries, brand new moms and moms to child number two or three. Those to whom the new role came naturally and those who were notably struggling. I remember how these meetings sometimes left me questioning my own choices when it came to raising my kids. As my confidence in myself and my parenting choices I was making grew, the mother-baby meetings started in some weird way to resemble high school reunions: you meet people who you should have so much in common with, yet being in the same class or, as I discovered, having a child is not necessarily a common denominator strong enough to create lasting bonds. Very unexpectedly, to me, Artipoppe became that common denominator bringing together mothers from across the globe that share love for babywearing and beauty. 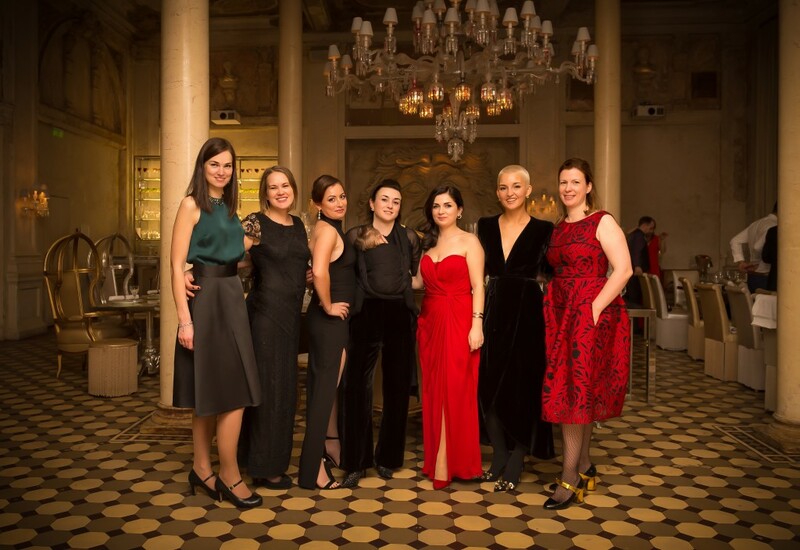 Because of Artipoppe, I have met the most amazing women – from different continents, speaking different languages and raising their families in various countries – with whom I share my views on motherhood, raising children, rediscovering yourself as a woman after becoming a mother. To me, Artipoppe has opened doors to my support system, to my village that makes me a better parent for my kids. As our babywearing journey is drawing to an end, I am grateful for what it has brought to me and my family. My kids associate wraps, or “hearts” as they call them, with a special time with me. My daughters still ask to be carried when their legs get tired on long walks, or when they need to reconnect and get undivided attention. I admire their ability to recognize and voice their needs – something I hope they will carry through life. And while the kids are growing and these special wrapping moments are becoming few and far between, friendships that I have made through my babywearing journey keep getting only stronger. Love for babywearing knows no borders, and for that I am grateful.